Does it make me a bad person that I just can’t even handle this video? I am happy for Kim Kardashian and Kanye West, but one just has to wonder whenever a Kardashian is involved . . . How much of this is for the publicity? Talks of this wedding will continue to keep the Kardashian name in the brightest portions of the spotlight — something we know they crave. Regardless of what you think or what we think, the wedding will happen in the near future, and we’ve got to give Kanye a round of applause for proposing in style. 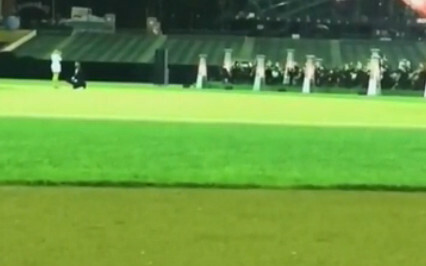 In the center of AT&T Park in San Francisco, Kanye got down on one knee and asked for Kim to be his wife. He employed an orchestra to play a sentimental song during his performance, and we’re surprised the band members didn’t leak news of him planning to pop the question before he had the chance to bend down on one knee. While you can’t hear a word Kim or Kanye say in the video, the hug and kiss Kim gives her man says it all: I DO. Check out the video below and let us know how you feel about this situation! Kim Kardashian Freaking Out, Kanye West Refusing To Marry Her After Getting To Know Her!